This is the third Christmas Mantel I have done this year! And the final one!!!! 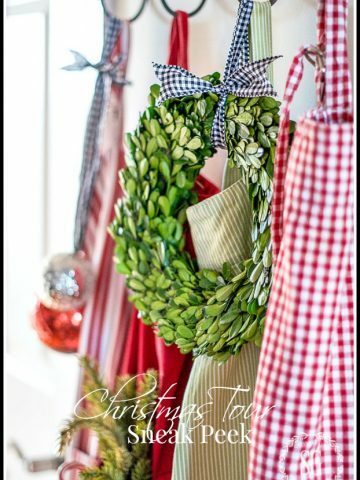 I’ve been trying to get just the right balance of farmhouse look and Christmas cheer! The black chippy shutters are a permanent fixture on the mantel, but the old crusty window is a new addition, found in the dark and cluttered recesses of my basement. I think it has been down there for 10 years! It became the perfect foil for a pretty long pine wreath! 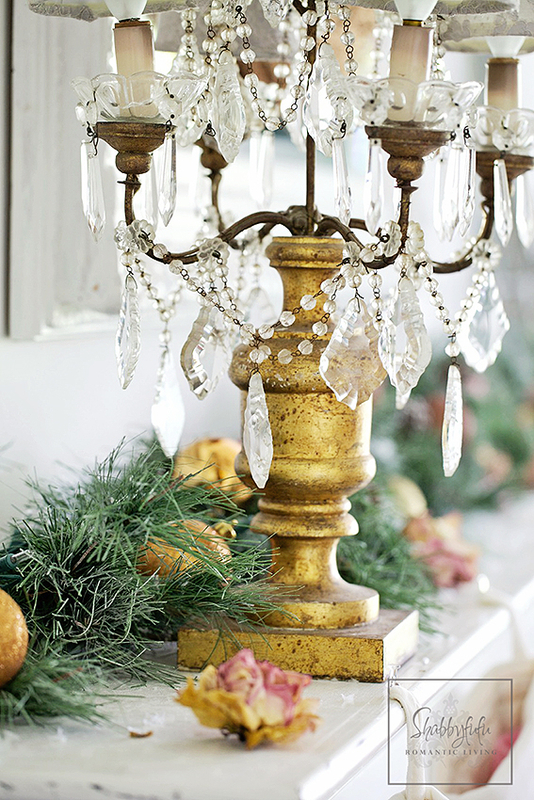 I think my favorite colors to decorate with are neutrals, whites and blacks… even at Christmas! Contrast is beautiful to me!!! 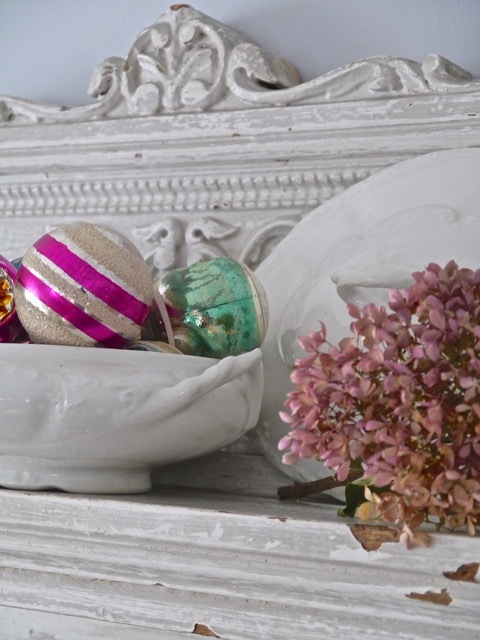 Today I am a part of CHRISTMAS MANTEL BLOG HOP! 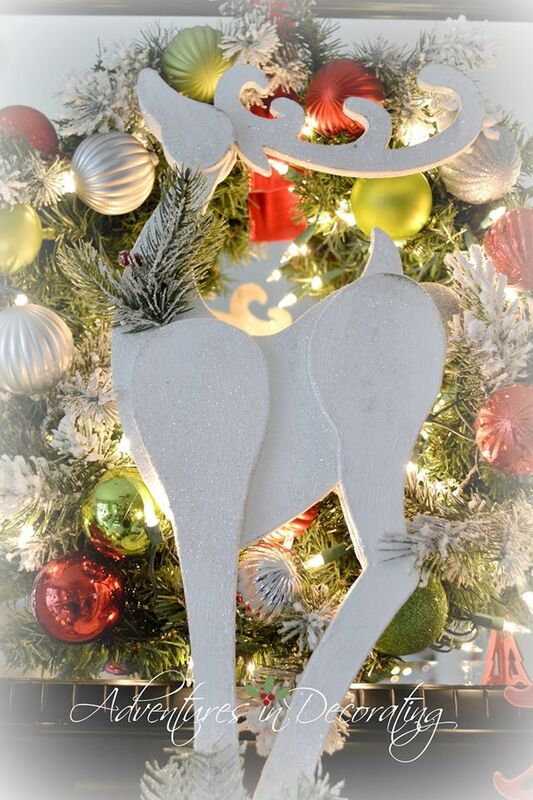 A BIG BIG THANK YOU to Pamela at FROM MY FRONT PORCH TO YOURS for putting this Christmas decor blog hop together! It’s sometimes like herding cats (adorable, friendly, awesome cats) when it comes to getting all the blogger’s together!!! Great job, Pamela! And this is all done for YOU… our wonderful readers!!!! What a great line-up! Make sure you visit the blogs at the bottom of this post! 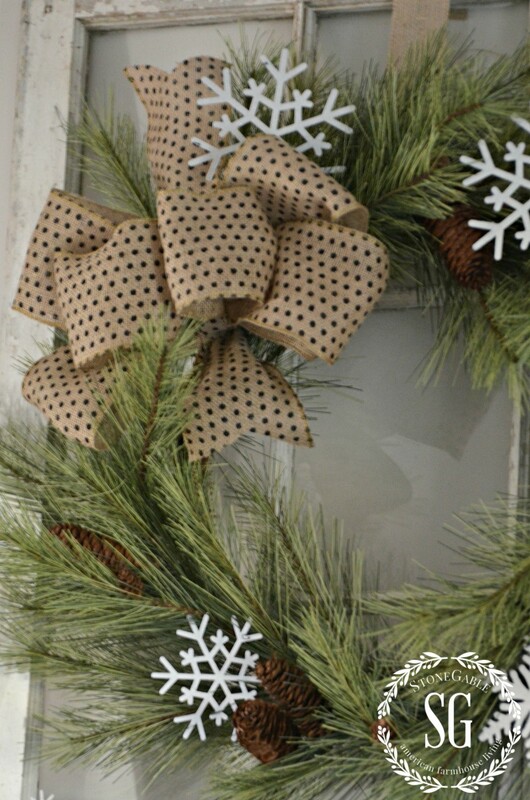 A burlap polka dot bow dons the evergreen wreath… and so do pinecones and snowflakes! 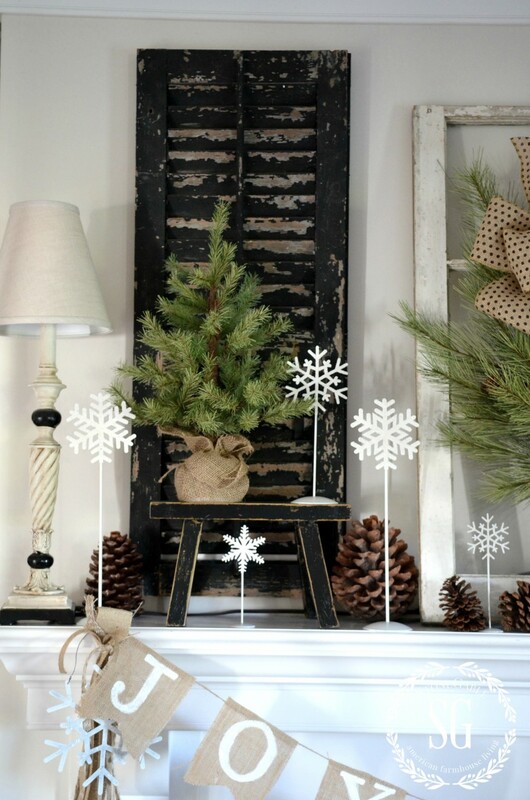 Pinecones and snowflakes line the ledge of the mantel. A little pine tree perches on a black bench! And a large pine tree sit on the opposite side of the mantel. 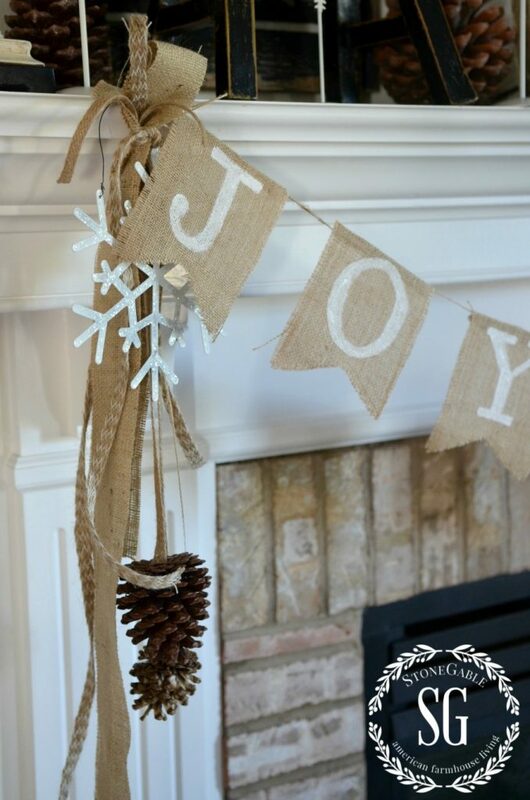 Another new addition to this year’s Christmas mantel is my JOY JOY JOY banner. It’s very easy to make. For a tutorial click HERE. The Christmas mantel took a long time to evolve this year! You just can’t hurry some things! 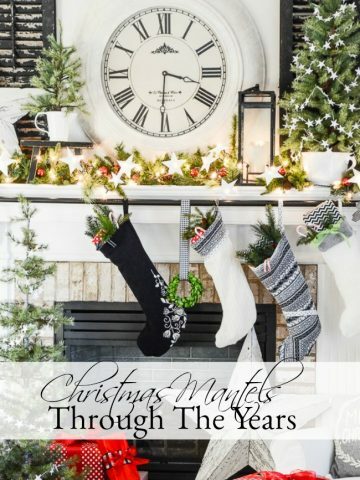 Make sure you visit all these wonderful blogs and Christmas Mantels! Remember to pin this to your CHRISTMAS pinterest board. And follow me on Pinterest HERE an see what I am pinning! Hi Crystal, we still have those chairs however they are slipcovered now. I got them at a local furniture store. The chair brand is Smith Brothers. I love it! Very farmhouse chic!! I love how it looks symmetrical with the addition of the bench for the smaller tree. Marry Christmas! Just loved this article. Now to use some of these wonderful ideas! I love your mantel! My mantel is not deep and I always struggle trying to find items to put on it. I would love to paint my fireplaxe surround and mantel white. Do the lights use batteries? I did not see any cords. I would love to find lamps that are not wide to sit on the mantel, but I do not like to see the cords. Any ideas? Also, I love the pine trees, where did you find those? I love the mantle and the colors you’ve chosen,just beautiful. Have a Merry Christmas with your family. 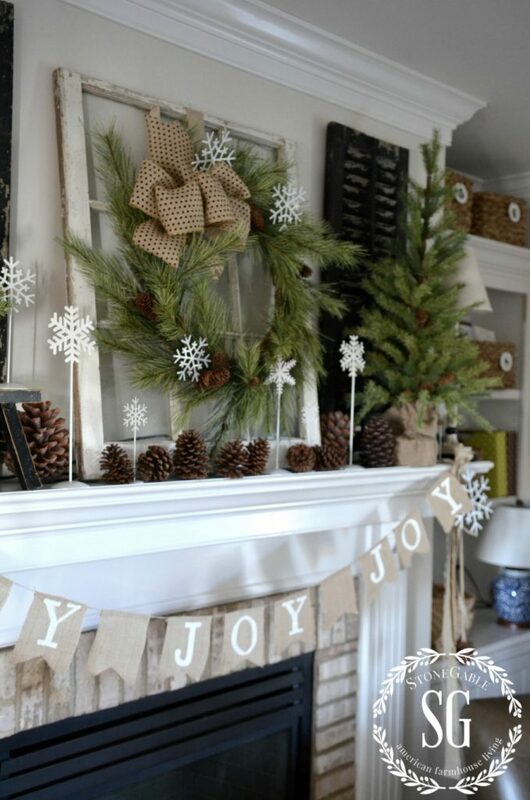 Yvonne I love your holiday mantel, you are so right about the contrast; the snowflakes and pinecones, trees and shutters! 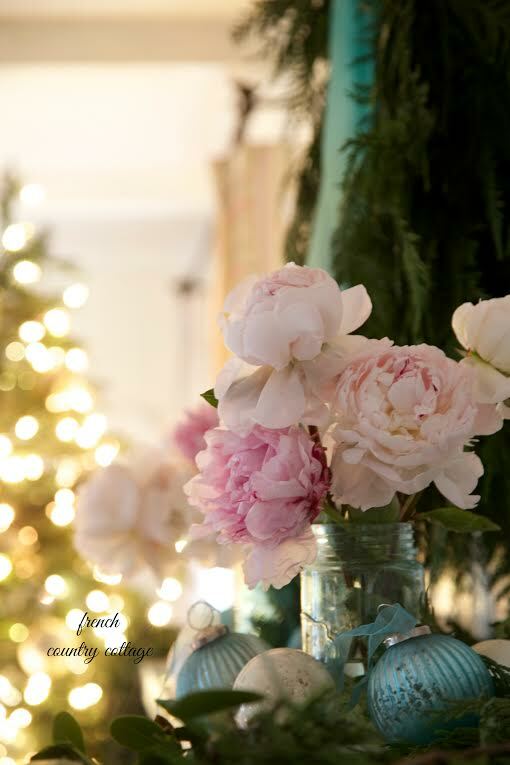 It all creatives a beautiful Christmas scene! Thank you for sharing , a wonderful tour! Your designs are always pitch-perfect. I recommended your site to my blog readers. You are teasing us, Yvonne! I’m ready to see the full house tour, especially all the family room, not just the mantel! 😉 Beautiful job! Yvonne: I had to tell myself to “breathe” as I was reading and loving the pictures so much. You are remarkable in your talent to do arrangements for your lovely home. Thank you for sharing…I am in awe of you. Where did you get your wreath from? It looks so real not fake like I only find. Beautiful posts as always. I have been looking for an old window and some shutters for my mantel. 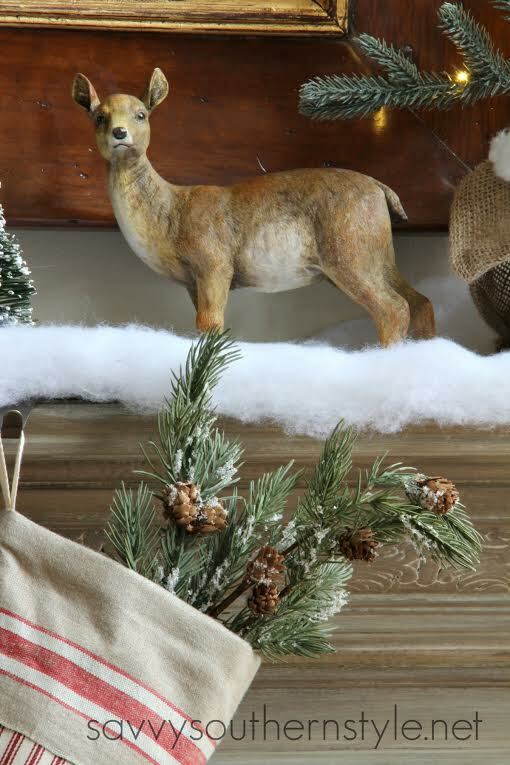 I love the farmhouse feel of this mantel! My kind of mantel! Yvonne, you do farmhouse better than anyone I’ve seen! 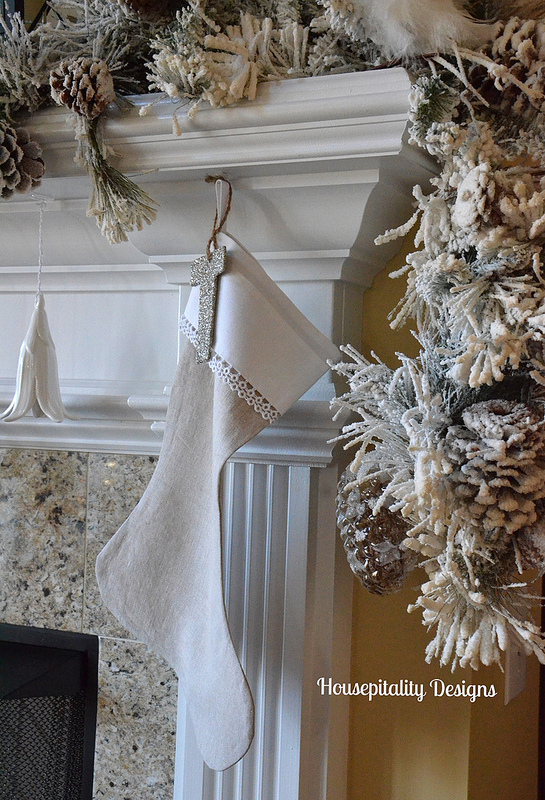 Your mantel is perfection! 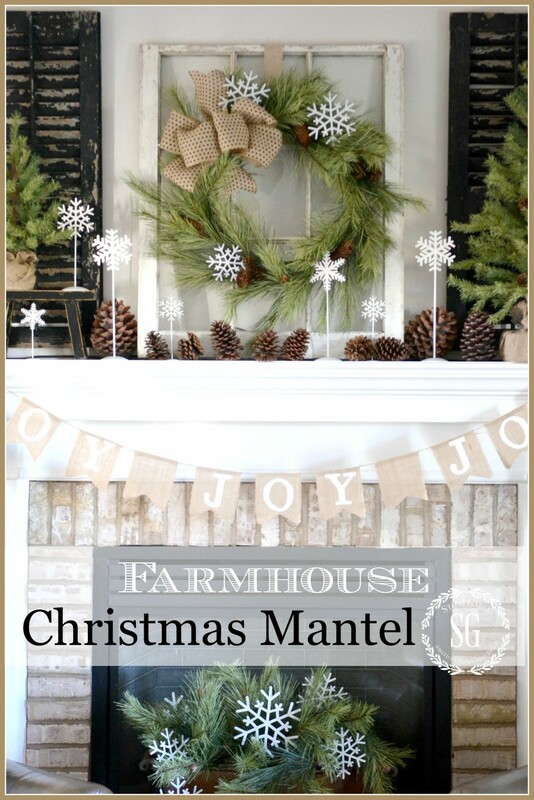 Yvonne, Your farmhouse mantle is perfect! I love the natural look and the snowflakes just pull it all together. 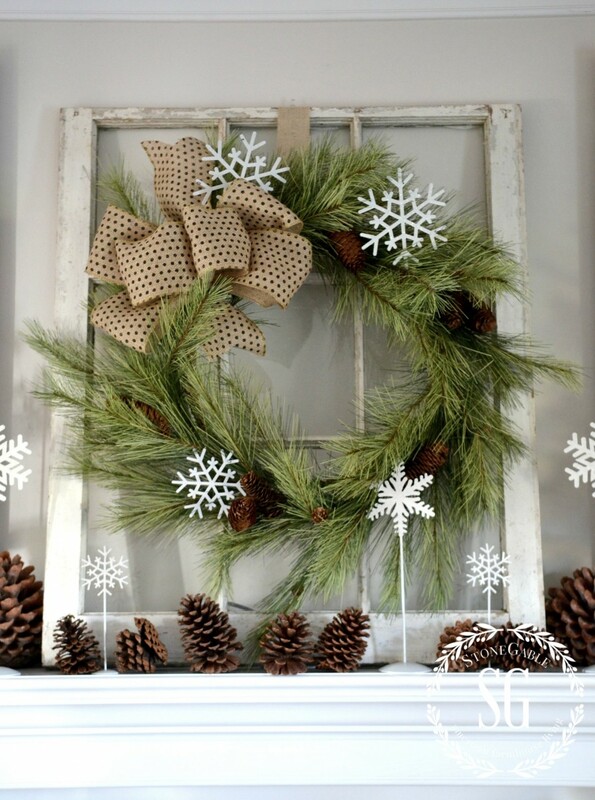 And how creative to use an old window for framing your wreath. =) Perfection! So pretty. I love the snowflakes, how stunning are they. 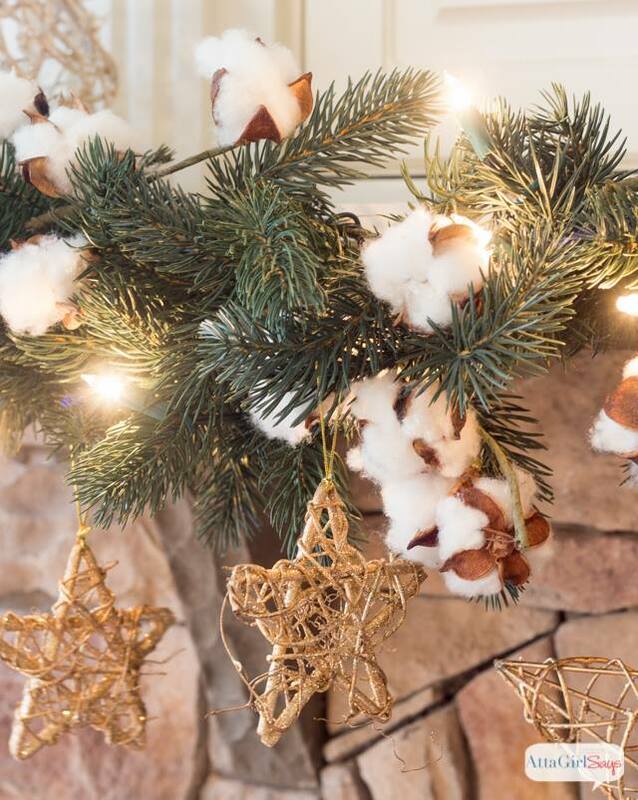 I am enjoying your neutral, natural Christmas theme this year Yvonne. 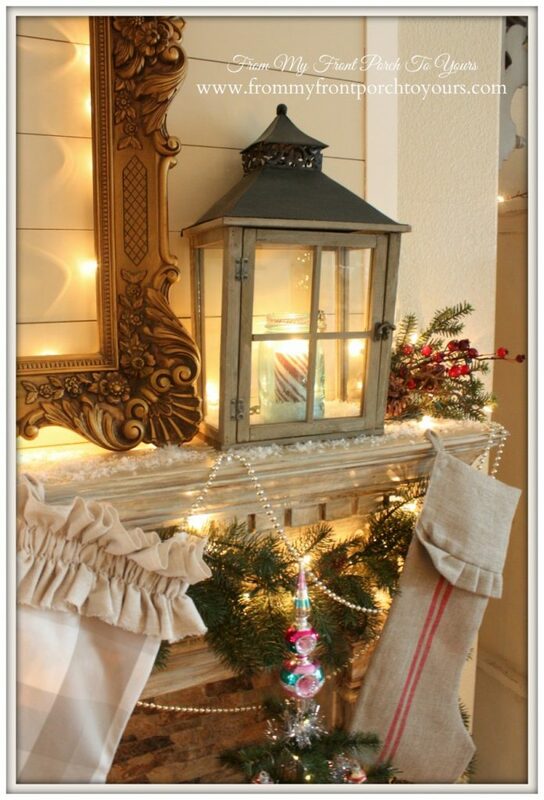 Beautiful mantel! Beautiful Yvonne! Love those stars,pinecone’s and those cool chippy shutters! 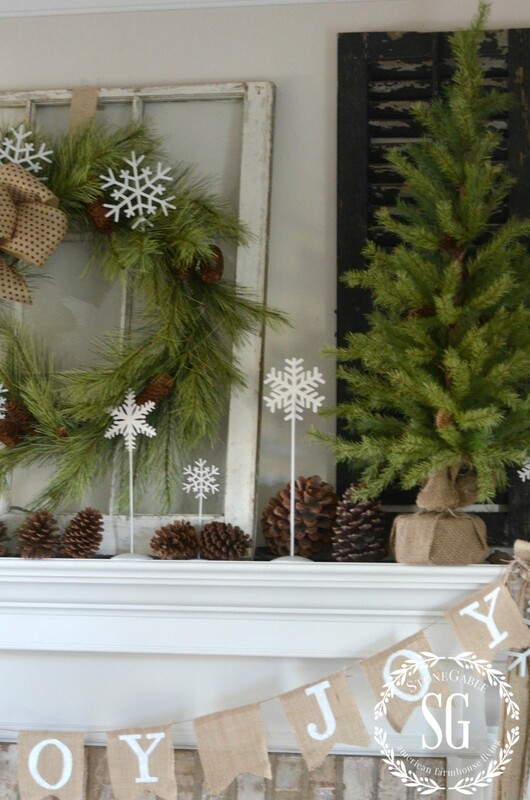 Love the look of the mantle Yvonne, the snowflakes on a stick are darling, I think I’ll make some today. Thanks for the inspiration. I love the fresh green and white look! Yvonne, your mantel looks wonderful! I love the old window, snowflakes and pine cones! Yvonne your mantel is just beautiful! I love the banner you have hanging from it. 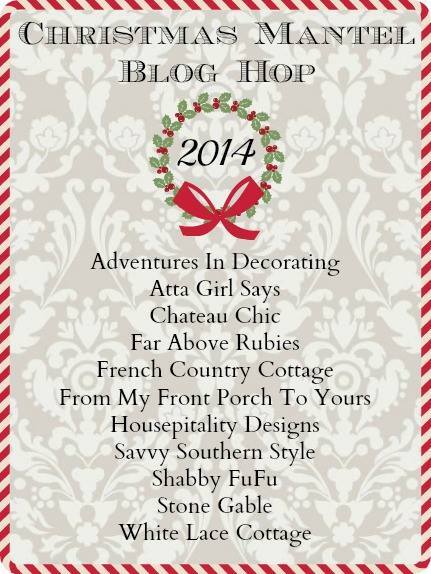 Thank you for joining the blog hop and happy holidays my friend! Loving the black touches with the shutters behind it all! 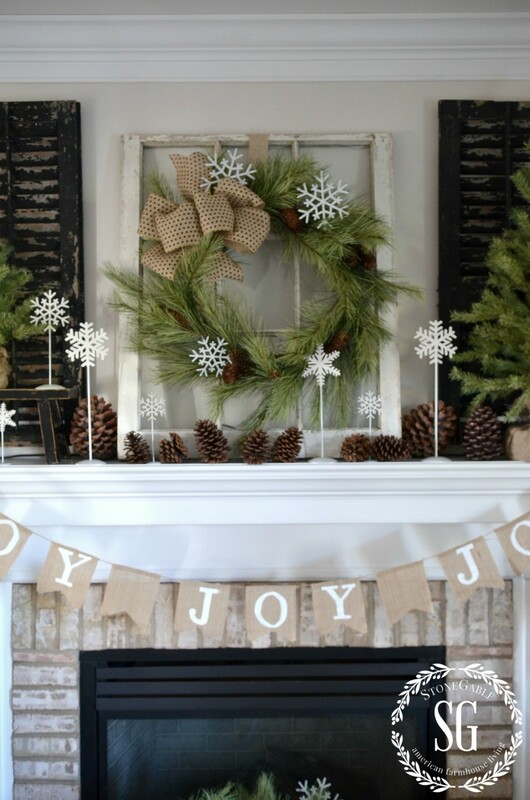 Love your mantel Yvonne…and those snowflakes on a stand are beautiful….and I must say that your banner reminded me of a song we sang in church….”I got the joy, joy, joy, joy down in my heart……” I am so loving your wonderful natural Christmas theme this year!! !…Have a wonderful day! 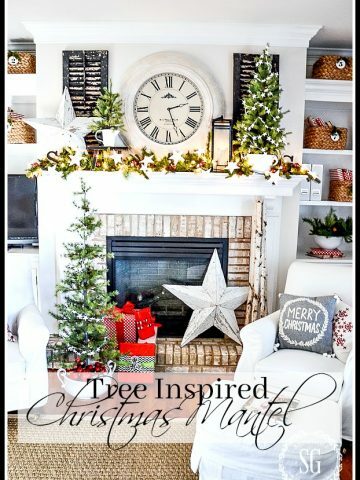 Oh my, Yvonne, love those trees on the mantel, esp the tiny one on the prim stool on the left! That, and the center basket on the floor make it for me. I like the window as a backdrop for the wreath, which appears to be real pine, and would therefore be protected from damaging the wall with sap while leaning on the window. My favorite is the photo showing your leather chairs – the entire view – classy & traditional, yet still with a farmhouse vibe. yvonne, look your color scheme this year. pretty and classy …just like you! 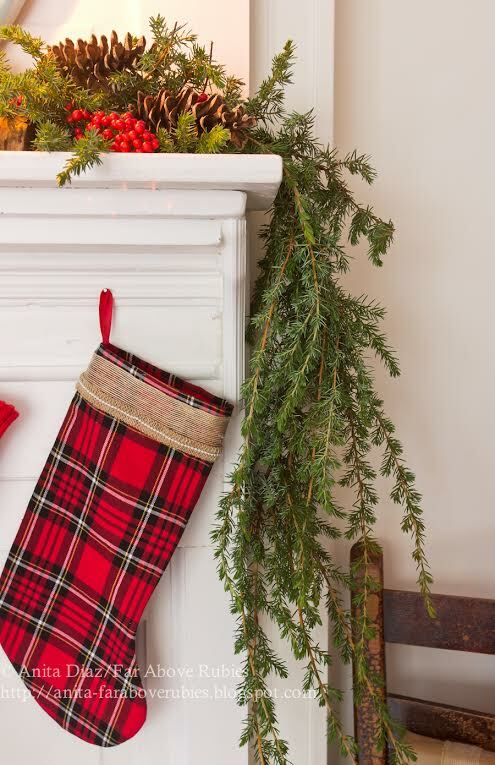 Your mantel definitely has a farmhouse vibe. Love the black shutters and window backdrop. Green and black together are stunning! Love it and knew you posted early when I was getting referrals from you. 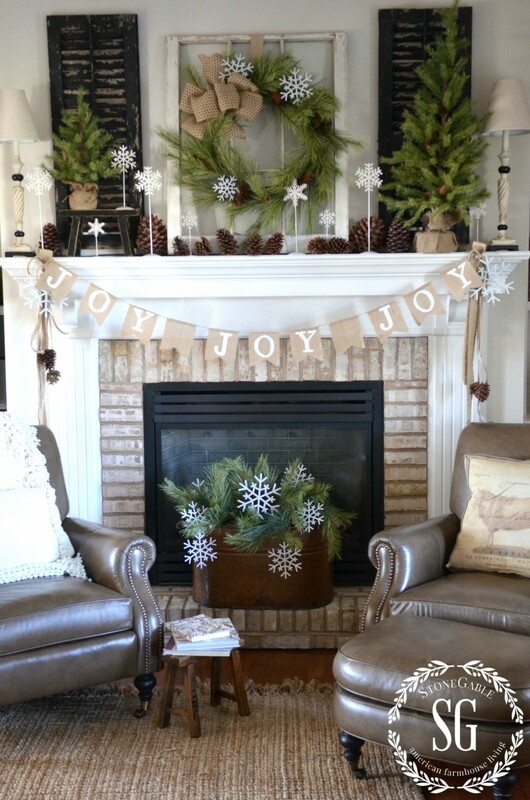 I love this mantel….the snowflakes are just a great addition and so is the little black stool….my goal is to finish my decorating today! Where did you get the white snowflakes on the stands? Did you make those or were they a purchased item? Beautiful, Yvonne! I love the trees (especially how you perched one on the cute bench) … the whimsical snowflakes … and, the wreath layered over the mirror! 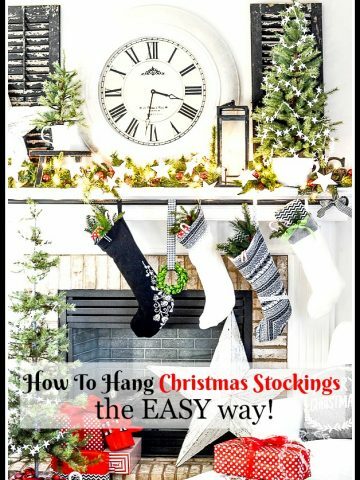 So festive in your home … I’m glad I get to “mantel party” with you!